Austin – Health Mate HM450+ : Air Purifier Review • The Air Geeks, reviews of air conditioners, dehumidifiers and air purifiers. Are you looking for a strong air cleaning solution for your large space? The Health Mate HM450+ is a powerful air purifier that is capable of eliminating a wide variety of airborne contaminants from your large room or office. This air purifier utilizes HEPA filtration to ensure that the air in your space is free from dust, smoke, pollen, bad odors, and so. If you have been coughing, sneezing, or experiencing difficulties in breathing due to high amounts of airborne pollutants in your room, then this air purifier is a suitable solution for your air cleaning needs. Before you order a particular appliance, it is always necessary to know its features, strengths, and weaknesses. If you are looking for reliable information about the performance of the Health Mate HM450+, then you have come to the right place. We have tested this air purifier and researched widely about it to provide you with information that you can depend on while selecting an appliance for your air cleaning needs. The Health Mate HM450+ is a powerful air purifier that is suitable for large spaces that are up to 1500 square feet. This air cleaning system employs the highly effective HEPA filtration mechanism to ensure that the air in your room is free from different types of airborne contaminants. It features a 60 square feet of medical HEPA. This filter is capable of capturing pollen, dust, smoke elements, and so on to ensure that your space has clean and healthy air. Some airborne pollutants are minute to be trapped by an ordinary filter. The HEPA filter of the Health Mate HM450+ is capable of trapping minute airborne particles that are as small as 0.3 microns. In addition, this air purifier is capable of capturing a large percentage of airborne pollutants before they find their way into your lungs. According to the manufacturer, this air cleaning solution captures up to 99.97% of airborne contaminants. This impressive performance guarantees your family clean air that is free from common airborne pollutants. Odors and chemical smells can ruin the environment of your room if they are allowed to dominate it. 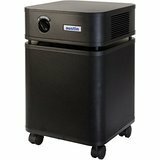 The Health Mate HM450+ uses granular carbon to trap gases and odors to ensure that your space has fresh air. The activated carbon is impregnated with zeolite and Potassium Iodide. In addition to removing airborne particles and odors, this air purifier is also capable of capturing disease causing microorganisms such as bacteria and viruses. Air goes through a series of filters before it is released into your room. The first filter, large particle pre-filter, captures sizable particles such as pet dander and air. From here, air goes through a medium particle pre-filter. This pre-filter removes medium-sized particles such as pollen, spores, and molds. The next filter, activated carbon filter, eliminates odors, gases and chemical smells. The last filter, HEPA filter, removes small particles (> 0.3 microns in size). The entire process ensures that the air released into your room is clean, fresh, and healthy for you and your family. When the motor of an air purifier breaks, it has to be replaced and the cost of such a repair is usually high. We have noted that many cases of motor-related problems have been reported. In case you are looking for an appliance that will serve you for many years without developing issues, then you need to factor the durability of the HealthMate’s motor before ordering the unit for your air cleaning needs. Low maintenance cost. The Health Mate HM450+ features a durable filter and a replacement is required after about 2 years. The cost of maintaining this unit is therefore lower as compared to other models. Relatively quiet. In the low setting, the unit can be used in a quiet environment because the air purifier runs quietly. The high setting is the loudest. Exaggerated filter durability. The manufacturer recommends filter replacement after every five years. We have observed that the filter wears out after two to three years. Motor issues. Although this air purifier is relatively durable, we have noted that many issues related to the motor have been reported. The cost of replacing this component is usually high. Less effective in removing cigarette smoke. Although this unit is excellent in capturing dust and pet dander, we have observed that it is poor in trapping cigarette smoke. We had some really stuffy noses form allergies in our house for a long time. After a week of using this, my daughters sinuses are much better. We have had this unit for over a year now and it works great! Easy to clean, easy to operate, and works really well. I had read some reviews saying this was loud. It does have a hum to it but no worse than a fan. It actually is nice to sleep with the "white noise" in the background. This was a great purchase and definitely worth the high price tag!" Expensive but does everything as advertised and exceeds all expectations"
The Health Mate HM450+ is a strong air purifier that is suitable for large spaces. This unit utilizes HEPA filtration to remove a wide range of airborne pollutants from the air in your space. Its activated carbon filter eliminates odor and chemical smells from the air to ensure that your room has a truly comfortable environment. On the downside, many cases of the motor breaking after less than three years have been reported. In case you feel that the strengths of this air purifier outweigh its weaknesses, then you can proceed and order one. You are the judge!